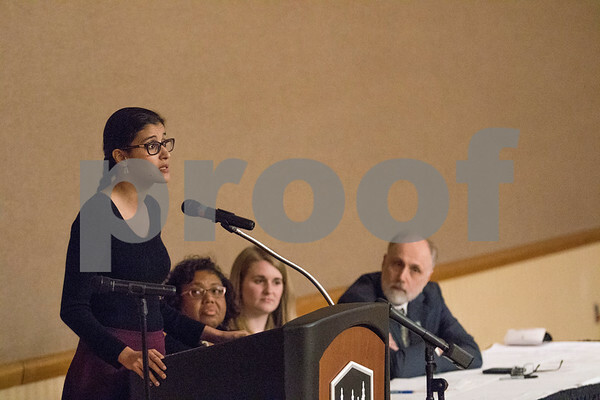 Writer and activist Aaminah Khan speaks during the "Allies in Interfaith" Diversity Dialogue at Northern Illinois University in the Regency Room at the Holmes Student Center on Thursday, April 21, 2016. NIU Chief Diversity Officer Vernese Edghill-Walden, Katie Gordon, program manager of the Kaufman Interfaith Institute at Grand Valley State University, and NIU President Doug Baker, sit at the main table next to Khan. Gordon was the other keynote speaker.